As we open up to life and love and each other, as we awaken from our dream of separation, we encounter not just the bliss of existence, but its pain too; not only life’s ecstasy, but also its agony. Healing doesn’t always feel good or comfortable or even ‘spiritual’, for we are inevitably forced to confront our shadows, fears and deepest longings – those secret parts of ourselves that we have denied, repressed, or deemed ‘negative’ and unworthy of our love. How can we find the calm in the midst of the storm? How can we rest, even as the ground falls? Falling In Love With Where You Are invites you to discover a deep YES to your life, no matter what you are going through; to see crisis as an opportunity to heal, pain as an intelligent messenger, and your imperfections as perfectly placed. 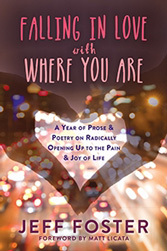 Through his prose and poetry, Jeff Foster will guide, provoke, encourage and inspire you on your lonely, joyful, and sometimes exhausting pathless journey to the Home you never, ever left: the present moment.